The Pre-Theatre Menu offering will run Tuesday, Wednesday and Thursday. Glovers Alley Pre-Theatre Menu will be available from 6pm until 7pm. 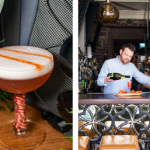 A new Pre-Theatre Menu at fine-dining restaurant Glovers Alley by Andy McFadden on St Stephen’s Green, Dublin introduces an appealing dining-out option for theatre-goers and anyone else seeking a stylish and relaxed early dining choice in the city this summer. The new Pre-Theatre Menu offers a choice of three starters, three main courses and two dessert options. While the Pre-Theatre Menu will change frequently in accordance with what choice ingredients are available, the type of dishes that diners can expect include Violet Artichoke with Hazelnut, Grapes & Foie Gras and Jersey Royals with Bacon Dashi, Wild Garlic & Chicken Skin to start with alongside main course dishes such as Veal Rump, Beetroot, Watercress, Grape Must & Mustard and Pollock, Carrot, Grapefruit & Bisque. Among the desserts you can expect are Rhubarb, Strawberry, White Chocolate & Lemon Balm and Nectarine, Sheep’s Yoghurt & Raspberry. 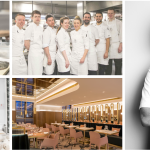 The new Pre-Theatre Menu is designed by Dublin-born chef Andy McFadden, formerly of Michelin star London restaurants L’Autre Pied and Pied á Terre, and bears the stamp of his signature Modern French cooking style. Andy oversees a talented kitchen and front of house team at Glovers Alley, which is a chic, sumptuous space with exquisite interior design elements and an attentive yet laid-back atmosphere. The Pre-Theatre Menu is available Tuesday, Wednesday and Thursday from 6pm until 7pm. The cost of the Pre-Theatre Menu is €35 for two courses or €45 for three courses. Glovers Alley by Andy McFadden is located at 128 St Stephen’s Green, Dublin 2, Ireland. Reservations are via the website www.gloversalley.com, email info@gloversalley.com or by phoning +353 (0)1 244 0733. Enjoy complimentary car parking when you dine in Glovers Alley during June, July and August on Tuesday, Wednesday and Thursday from 6pm to 12 midnight. Your car parking ticket will be validated at the front desk of the Fitzwilliam Hotel with a valid receipt from the Glovers Alley Pre-Theatre Menu. Join the conversation on the Glovers Alley by Andy McFadden Facebook page, Twitter (@GloversAlley) and Instagram (@GloversAlley).